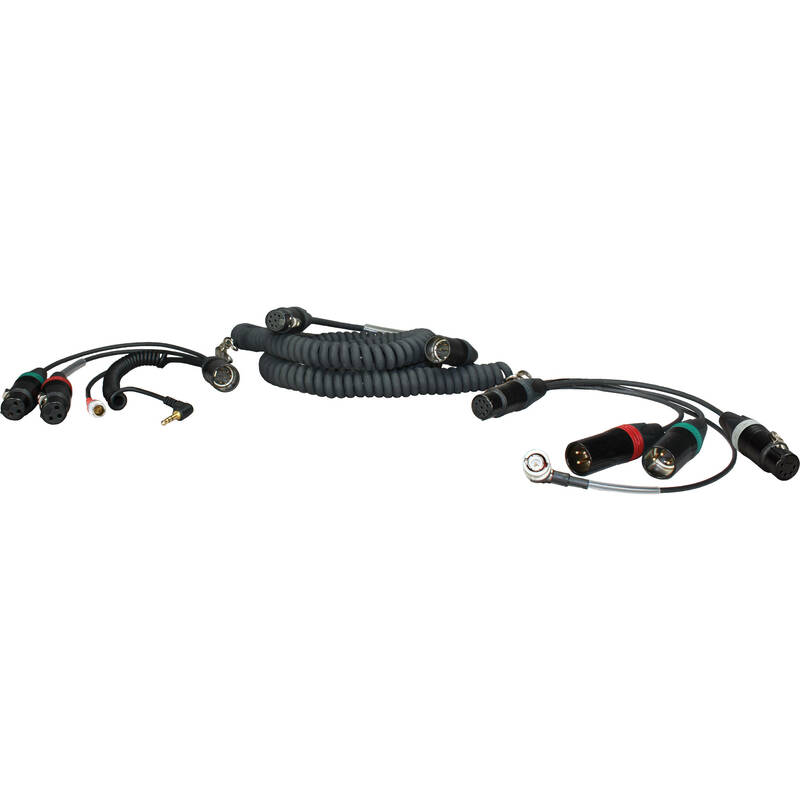 The Coiled Breakaway Cable for Sound Devices 664 from Ambient Recording is used to connect a Sound Devices 664 mixer to a digital camcorder featuring a 5-pin XLR mono return to camera. It consists of three sections that come apart: two Y-breakout cables (one connects to mixer and one to camera) and a coiled breakaway cable in between. The overall extendable length of the cable is 15'. The XLR 7-Pin Male to XLR 7-Pin Female Coiled Mixer/Camera Loom Cable from Ambient Recording is a breakaway cable that provides two balanced lines (single shielded) and two leads for the return signal. The coiled cable reaches from over four feet when at rest, all the way to over sixteen feet when extended. The cable features a 7-pin XLR male connector on one end, and a 7-pin XLR female at the other. The cable needs the appropriate breakout cable adapters (Y-cables) for use with specific mixer and camera combinations. The HBYATC-L-7-35W Breakout Y-Cable from Ambient Recording features the mixer-side Y-cable for a Sound Devices 664 mixer-camera loom. At one end of this Y cable is a 7-pin XLR connector. On the other end are two XLR connectors, one 3.5mm TRS, and a 5-pin Lemo connector. The Ambient Recording HBY7TC-5 Breakout Cable allows you to connect devices with a 7-pin XLR female connector to those with dual 3-pin XLR male connectors. It also features return via Mono return via 5-pin XLR female.